How does an American liberal become an islamic jihadist in a distant land? This eleven page story from the New York Times describes how Omar Hammami from Daphne, Alabama, has become a key figure in one of the world’s most ruthless Islamist insurgencies. That guerrilla army, known as the Shabab, is fighting to overthrow the fragile American-backed Somali government. The rebels are known for beheading political enemies, chopping off the hands of thieves and stoning women accused of adultery. With help from Al Qaeda, they have managed to turn Somalia into an ever more popular destination for jihadis from around the world. Dena, Omar’s older sister, offers this conflicted reply. “I think it’s admirable to stand up for what you believe in, but it gets hairy when you affect the lives of others,” she wrote. Hairy. That’s an interesting way to describe killing, maiming, beheading, and stoning others. I think that’s a cop out. I think we need to educate people to better understand and appreciate that what makes individual freedom possible is our collective and primary allegiance to and respect for secular enlightened values of equality, dignity, and fairness. There are far too many of us who think allegiance to the state and the religious majority it supposedly represents is where our allegiance properly belongs, but this misdirection and misunderstanding is as much to blame for creating more Omars as is the religion of islam. As the push in Western democracies continues to promote government support for christian values, the greater is the danger we face that we will lose our freedoms. We need to wake up, get off the fence, and push back any encroachment by anyone who campaigns or acts against the primacy of secular values. Does research back up the popular belief that children need both a mother and a father? “The bottom line is that the science shows that children raised by two same-gender parents do as well on average as children raised by two different-gender parents. This is obviously inconsistent with the widespread claim that children must be raised by a mother and a father to do well,” Biblarz said. This study is published in the February 2010 issue of the Journal of Marriage and Family. Why does gay marriage need to be made legal? ROBERTSVILLE (Missouri) — When Highway Patrol Cpl. Dennis Engelhard was killed in a Christmas Day traffic accident near Eureka, the agency described him as single with no children. A fraternal organization that provides benefits to the families of troopers killed in the line of duty is also unsure if it will help Engelhard’s partner. Why can’t a Pope be honest? Once again, our favourite Holy Father – affectionately known by many as Pope Palpatine – steps into the public domain and vilifies those who struggle to establish human rights and dignity into law by associating their secularism – their worldly concerns about real people undergoing real suffering – with a heavenly host of evils like indifference, relativism, hedonism, abuse of Creation, an enemy of the common good, a force against peace, an attack against the centrality of the human person, promoting misery like hunger, poverty, illiteracy, and a cause of unequal distribution of goods. In other words, in the mind of this Pope and his predecessors, secularism is the common enemy of The One True Faith, which just so happens to be the Catholic Church, of course, and the only spiritual institution that is FOR a kind of human rights and dignity agreeable to a misogynistic god. A good thing that Pope Nazinger has properly identified the culprit that continues to wreak such havoc in the world… you know, the one that brought us those disgusting anti-church (read anti-god) Enlightenment values. And yes, the sum total of these worldly values established by law in liberal democracies is called secularism. And it is under attack by the promoters of superstition. Again. So what is a good christian to do? “In a world marked by religious indifference, and even by a growing aversion towards the Christian faith, a new, intense evangelization is necessary, not only among people that have never known the Gospel, but also among those in which Christianity has been spread and is a part of their history,” Pope Benedict said emphatically. “While we are on the path towards full communion, we are called to offer a shared witness against the ever more complex challenges of our time, including secularization and indifference, relativism and hedonism, the delicate ethical themes regarding the beginning and end of life, the limits of science and technology, dialogue with other religious traditions,” Benedict XVI urged. There’s saved, and then there is saved. I’m sure that’s what the call to shared witness means when discussing delicate ethical themes – not with evil secularists who are obviously the root cause of so many problems but with other religious traditions. There’s nothing quite like having a dialogue with a tradition to find consensus. Oh, wait… The One True Faith doesn’t seek consensus. It seeks only a one way conversion to obedience… from those who hold wrong beliefs to those who hold right beliefs. That’s it. That’s the whole point to the Church regarding humanity with anything close to respect and dignity. But why should these believers in religious totalitarianism have anything meaningful to say about ethics at all? Based on what? Dogma? Why should the religioun fascio be granted a platform to have their unenlightened say about anything at all concerning real people in the real world, never mind beginning and end of life issue and the limits of science and technology? The Church leadership consistently cares only about conversion and obedience, and they are not honest about having a meaningful dialogue with anyone knowledgeable about delicate ethical issues nor actually addressing, never mind solving, worldly problems. Such secular concerns have already been assigned proper blame, ridicule, and scorn by all Catholic Church authorities. But rest assured: the one thing you won’t hear from any Pope before, during, or after intense evangelization is honesty. Evidence for the power of natural selection: Robotic evolution. How so? So far, evolutionary robotic experiments have been conducted mostly by computer scientists and engineers. Their primary interest has been to exploit the power of artificial evolution to automatically generate novel or better control systems and body shapes for specific problems. For example, the method of evolutionary robotics described in the context of cooperative behaviour has been successfully used to generate the control systems of a swarm of micro aerial vehicles that must locate rescuers and spread so as to establish a radio communication network based uniquely on signal strength of the rescuer mobile phones and of the robot emitters, a problem for which existing engineering solutions require the use of absolute geo-localisation information provided by GPS signals . The use of real robot features are particularly useful in an evolutionary perspective where behaviour and ensuing complex physical interactions can significantly affect the interaction with the environment and performance. Therefore, evolutionary robotics also offers new opportunities to address issues such as sexual selection, division of labour, speciation, and, in general, the open-ended evolution of diversity and complexity in behavioural systems. But isn’t evolution ‘only’ a theory? Not in medicine as an applied science; it is a basic and necessary understanding. A recent series of article in the Proceedings of the National Academy of Sciences (PNAS) discusses the role of evolutionary biology in modern medicine. The authors collectively make a forceful point – medicine is an applied science. It is based upon a number of basic sciences, and one of those basic sciences is evolution. Many examples in medicine provide a compelling case that evolutionary principles are important to understanding populations, genetics, infectious disease, diet, and other issues of public health – in diagnosis, treatment, and research. Therefore, the authors argue, evolution is an important topic for medical professionals to understand . Increasing the basic science standards for medical students can only help the goals of science-based medicine, and I am glad to see that evolutionary biology is being recognized as the core basic science that it is. Is this what is meant by religions promoting fairness and equality? To hear many Christian apologists, one might think that it was their religion that championed such enlightenment values as equality and freedom to the fore of Western civilization. That’s a lie. Christianity has had to be dragged kicking and screaming away from its righteous and pious grasp on political power and beaten into submission by law to take its place in the modern secular liberal democracy. But the fight is not yet over. “However, unless the present drafting of the Bill is changed, churches and other faiths will find themselves more vulnerable to legal challenge than under the current law. Note how these religious men assume that the secular liberal democracy is based not on secular values and secular law, which is the truth, but on this ill-defined notion of ‘Christian values’. The truth is already being twisted here. Then they ask that we recognize that individual equality should be submerged in favour of rights and freedoms for ‘groups’, a set of rights for these groups that are in need of ‘balance,’ which is code for special rights for special groups like…. oh, I don’t know, maybe churches because they are very special and deserve exemption from anything as dirty and mundane as a level legal playing field. Something as dirty and mundane as equal legal rights is properly viewed to be harassment and discrimination! In the minds of these men, not being granted special dispensation to maintain discriminatory practices is… wait for it… discrimination! But let’s be clear, they reassure us, this church is all for promoting fairness and equality… in a ‘wider’ sense… so wide, in fact, that churches and other special interest groups under the banner of religious belief can avoid the equality law altogether so that they can continue unimpeded to discriminate all they want, exempt from prosecution under secular law. I think it’s time to get ready for more kicking and screaming because these biased, bigoted, bullying, and chauvinistic theologies are not going to ‘champion’ any advancement in secular law that promotes equality and respect of individuals; they will do as they have always done and fight such progress tooth and nail. 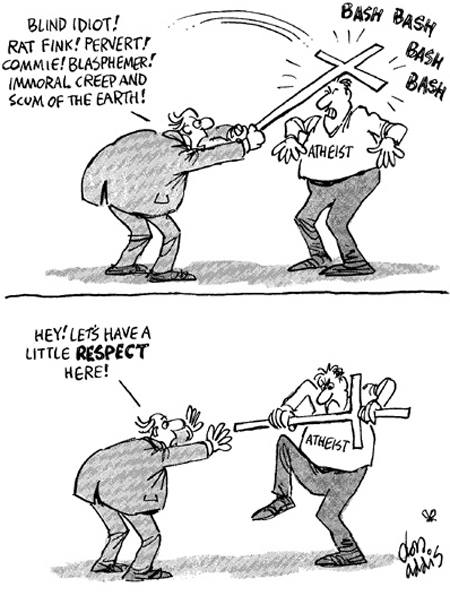 Christianity according to Dawkins: a haven for apologetic hypocrisy? We know what caused the catastrophe in Haiti. It was the bumping and grinding of the Caribbean Plate rubbing up against the North American Plate: a force of nature, sin-free and indifferent to sin, un-premeditated, unmotivated, supremely unconcerned with human affairs or human misery. The religious mind, however, restlessly seeks human meaning in the blind happenings of nature. As with the Indonesian tsunami, which was blamed on loose sexual morals in tourist bars; as with Hurricane Katrina, which was attributed to divine revenge on the entire city of New Orleans for harboring a lesbian comedian, and as with other disasters going back to the famous Lisbon earthquake and beyond, so Haiti’s tragedy must be payback for human sin. The Rev. Pat Robertson sees the hand of God in the earthquake, wreaking terrible retribution for a pact that the long-dead ancestors of today’s Haitians made with the devil, to help rid them of their French masters. Needless to say, milder-mannered faith-heads are falling over themselves to disown Pat Robertson, just as they disowned those other pastors, evangelists, missionaries and mullahs at the time of the earlier disasters. Loathsome as Robertson’s views undoubtedly are, he is the Christian who stands squarely in the Christian tradition. The agonized theodiceans who see suffering as an intractable ‘mystery’, or who ‘see God’ in the help, money and goodwill that is now flooding into Haiti , or (most nauseating of all) who claim to see God ‘suffering on the cross’ in the ruins of Port-au-Prince, those faux-anguished hypocrites are denying the centrepiece of their own theology. It is the obnoxious Pat Robertson who is the true Christian here. Read the rest of Dawkins’ On Faith article here. What is Canada’s mental health strategy? Combat Satan! The new Canadian Mental Health Commission is “a wonderful opportunity” for Christians to be involved in dealing with one of the most pressing issues in our society, according to one of its members. Chris Summerville is one of 11 non-government members of the new Commission’s board of directors. Summerville said he hopes to bring a holistic approach to the issue that addresses body, mind, soul and spirit. Summerville said one of his goals is to “bring the presence of Christ” into the different perspectives that will be present in the Commission. Prime Minister Stephen Harper announced the formation of the commission on August 31. It grew out of a study by a Senate committee chaired by Senator Michael Kirby, who will chair the new Commission. The Commission’s board of directors includes 11 non-government experts and six government representatives. The Commission will receive $10 million in start-up funds until mid-2009 and then $15 million a year after that.